Now there is a SilenceSam.com website! Please join the rally in North Carolina this Monday Morning – or tweet and spread the word however you can. Thank you! 🙂 Here’s the Full Text of the letter from Maya’s fellow graduate students in support of her actions. The UNC Faculty support her actions. Here is Maya Little’s full statement on the matter. It’s time for #UNC’s Silent Sam monument to be moved off campus and into whatever historical entity would like to have it. It’s done enough damage to the students, faculty, the community of Chapel Hill, North Carolina, and the entire United States of America. As an educator and historian, I am nothing less than offended by its very existence. 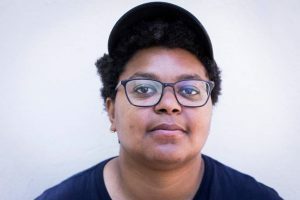 Maya Little is a graduate student getting her PhD in History at the University of North Carolina. 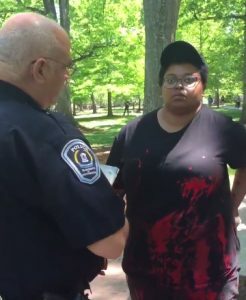 She was arrested on April 30th for conducting a peaceful protest, in broad daylight, where she poured red ink, mixed with her own blood, on to the Silent Sam monument. Please tweet and speak out on her behalf this weekend, leading up to Monday morning, May 7, at 9 am – when she will be having a court hearing about her arrest. Maya Little is a PhD graduate student, majoring in history, at UNC. I first found out about the Silent Sam monument, and the horrific story behind it, when heard that Chelsea Manning spoke at a protest there in March. Until I looked up the very informative Wikipedia page on Silent Sam, I had no idea about the history behind this monument. When I learned it was another monument that was placed by the “United Daughters of the Confederacy” – I couldn’t believe the thing was still standing. That statue literally depicts a white college student, as he drops his books to go fight in the Civil War (in the hopes of continuing the practice of slavery). Maya Little, getting arrested at the protest against Silent Sam. 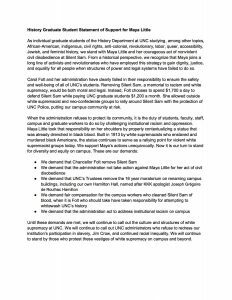 So, with good reason obviously, PhD history student Maya Little went back to Silent Sam, on April 30th to draw more attention to this festering issue, and was promptly arrested. Her hearing is THIS MONDAY, May 7, and we need to show support for her! Carol Felt and her administration have clearly failed in their responsibility to ensure the safety and well-being of all of UNC’s students. Removing Silent Sam, a memorial to racism and white supremacy, would be both moral and legal. Instead, Felt chooses to spend $1 ,700 a day to defend Silent Sam while paying UNC graduate students $1,200 a month. She allowed outside white supremacist and nee-confederate groups to rally around Silent Sam with the protection of UNC Police, putting our campus community at risk. This entry was posted in Chelsea Manning, Remove "Silent Sam" from UNC, United Daughters Of The Confederacy Monument Removal and tagged Maya Little, Silent Sam, UNC, United Daughters of the Confederacy on May 3, 2018 by Lisa. Yay! See her new website here. This election is SOOOO important folks. Even though it’s a mid-term election – nothing less than the future of our country is at stake. Chelsea’s positions might just be “dream” positions. Re: how we would make things if we only could. Well, what if we tried to make these positions really happen? And insisted that other candidates at least went in that direction, for us to support them? We would end up with something at least a little closer to the ideals we want. That’s what. I, for one, am going to try. This entry was posted in Chelsea Manning and tagged Chelsea Manning for U.S. Senate on May 1, 2018 by Lisa. New – Saturday May 5 – SilenceSam.com website! 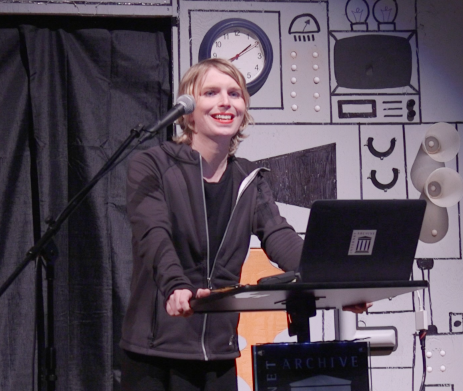 Chelsea Manning protesting at the Silent Sam Monument, on March 24, 2018. 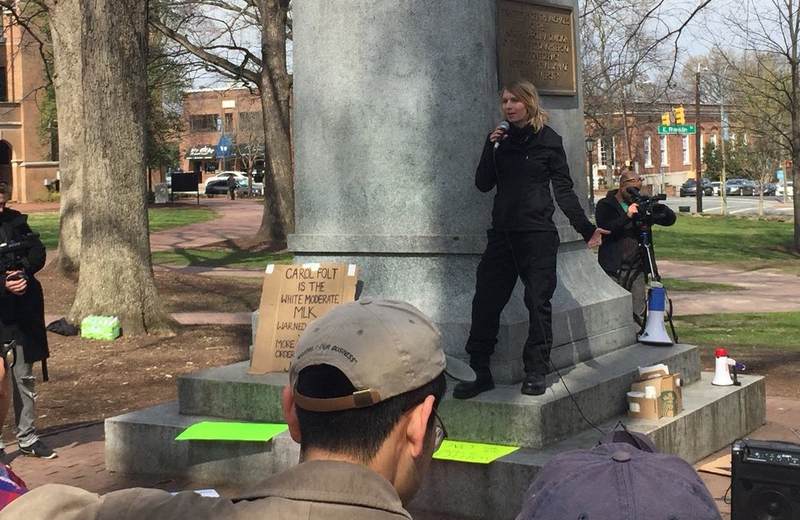 Chelsea Manning attended the Silent Sam protest on March 24, 2018 at the University of North Carolina. Why is this monument still standing? Because the University of North Carolina would rather pay thousands of dollars to guard its white supremacy statue than listen to its community about the correct way to proceed. This entry was posted in Chelsea Manning, Remove "Silent Sam" from UNC, United Daughters Of The Confederacy Monument Removal and tagged Silent Sam, UNC, University of North Carolina, White Supremacy on March 25, 2018 by Lisa. It’s Sunday, and my present to myself (for Chelsea’s 30th birthday) is that I’m going to start blogging again today. Chelsea turned 30 today, and it was her first birthday as a free woman. I transcribed her Aaron Swartz Day talk for the occasion. 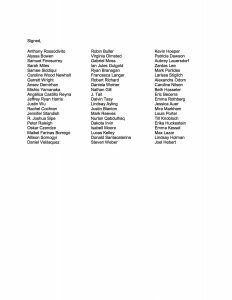 This entry was posted in 2017 Aaron Swartz Day, Chelsea Manning on December 17, 2017 by Lisa.